Great words by our good friend Dr. Don Thomas. Guest opinion: What can dark money buy in Montana? The “evidence” for these allegations consisted of screeds provided by the Montana Outdoor Coalition and the Green Decoys advertising campaign. This material originated from the Environmental Policy Alliance, created by notorious Washington, D.C., lobbyist Rick Berman, which has a long history of organizing front groups to promote the tobacco industry, oppose environmental regulation, and support climate change denial. Berman is recognized for his ability to use dark money to manipulate public opinion and local elected officials. In 2014, the New York Times reported remarks Berman made to an energy trade association meeting: “We run all this stuff through nonprofit organizations that are insulated from having to disclose donors. There is total anonymity. People don’t know who supports us.” This sounds like just the kind of dark money influence that now concerns the Montana Outdoor Coalition and the Ravalli County Commissioners. The complaint to the Ravalli County Commission came from Keith Kubista of Stevensville, who has held leadership positions in Montana Sportsmen for Fish and Wildlife as well as the MOC. It’s hard to know much about MOC, since its own website contains no meaningful information and there is no record of public disclosures. For a group concerned about dark money, MOC doesn’t show much interest in transparency. Utah-based Sportsmen for Fish and Wildlife has a long record of promoting the sale of public lands and the commercialization of wildlife. In 2011, the NRA and Safari Club International — hardly environmental extremist groups — censured them after they falsely claimed NRA and SCI support for their position on a controversial wolf management issue: “Due to the blatant misrepresentation in the press release circulated by these two groups (SFW and another spinoff, Big Game Forever), any claims they make in the future should be independently verified and confirmed.” The Ravalli County Commissioners failed to heed this advice. Hopefully, Attorney General Tim Fox won’t make the same mistake. The commissioners’ letter prompts several questions. Can any “local citizen” demand an investigation into grassroots Montana organizations whose policies they oppose with no valid evidence of wrong-doing? Why are the commissioners paying attention to information from a Beltway operative of proven unreliability? County commissioners and the attorney general are elected officials operating at taxpayer expense. Surely, they have better things to do with their time and resources. 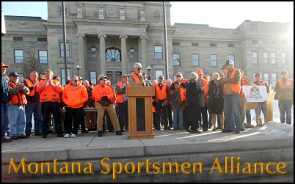 If the concern is really the impact of outside dark money upon Montana politics, wouldn’t an investigation be better directed toward Green Decoys, the Environmental Policy Alliance, the Montana Outdoor Coalition and Sportsmen for Fish and Wildlife? Don Thomas is a longtime outdoors writer who lives in Lewistown.